Google GDrive Launches. Just Don't Call It That. “This is not GDrive” said Google Docs product manager Vijay Bangaru yesterday while showing me something that sure does look exactly like the fabled GDrive. “How is it different,” I asked. Alrighty then. Putting that aside, you can soon upload any file type at all to Google Docs, not just the dozen or so Office formats that the service allowed as of yesterday. Video files. Images. Audio Files. Even Zip files. As long as those files are 250 MB or smaller, you’re good. The new feature will roll out over the next several weeks, says Google. 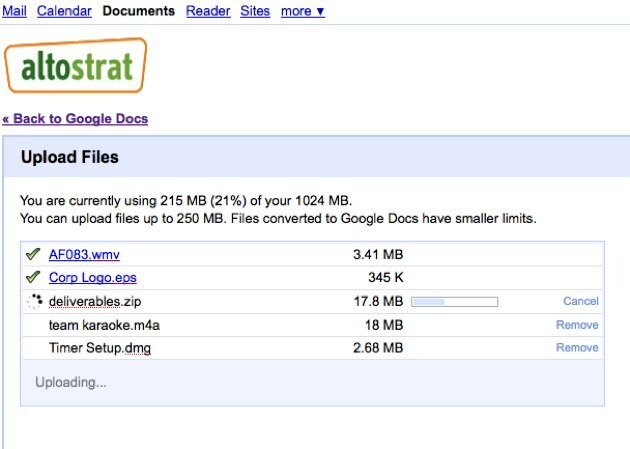 Like other documents in Google docs, files can be kept private, made public or shared with a few users. Google Viewer can be used to view many file types, with the notable exception of video. Regular users have 1 GB of free storage and can purchase more for $0.25/GB. Enterprise customer pay higher prices, starting at $17/year for 5 GB. There are no bandwidth charges. Three partners have been working with Google to build value add features on top of the new product. The most interesting, Memeo Connect (from Memeo), lets users sync files between the desktop and Google Docs. Syncplicity is offering businesses an automated backup and file management application. And Manymoon, an online project management application, is also now integrated with Google Docs file storage.